Named a Golf Digest “Best Places to Play” and Central Oregon’s favorite golf course by Central Oregon Magazine, River’s Edge Golf Course off Mt. 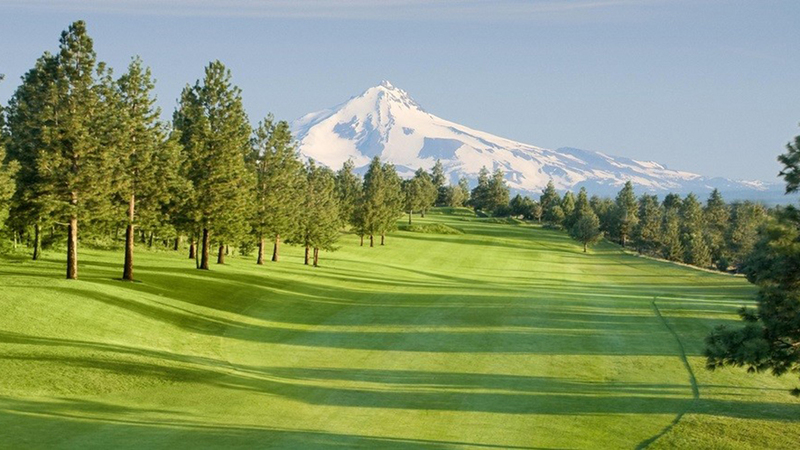 Washington Dr in Bend offers 18 holes to challenge your golf skills on one of the few Bend golf courses open year-round. This par-72 course has spectacular scenery with gorgeous views of the Deschutes River, Mt. Jefferson and Mt. Hood. The sixth hole is a challenge with an approach shot to an elevated green featuring a 25 foot waterfall. Golfers also love hole 16, measuring 216 yards from the back tees to the green 200 feet below. Whether it’s before or after your round of golf, River’s Edge offers all the amenities you would expect from a world-class golf resort, including a modern clubhouse featuring a fully-stocked pro shop with rental clubs from Titleist and Nike Golf, a full-service, family friendly restaurant and bar with a large deck overlooking the first tee and 18th green. It’s the perfect place to enjoy a post-golf snack or beverage while taking in the views. Nearby, golfers will find a grass tee driving as well as a large practice green and chipping area.